I'm in my second full season of hunting with Trad Gear and my 28th season of archery hunting. Something happened today that hasn't happened to me before(with Trad Gear). Prior to today, I have taken 8 deer and 2 turkeys with trad gear. This afternoon, I headed out to the target to take my pre hunt practice shots. I had hoped to take my BBO that I shot a turkey with in the spring. It popped a splinter in October and I had just gotten around to fixing it. I shot 3 arrows at the target and was NOT pleased with the results. I quickly went inside and got my glass long bow and shot 4 arrows in a nice tight group at 18 yards. Even better than normal for me, so the obvious choice was the glass longbow since I hadn't practiced much with the BBO. The wind was perfect for a spot that we normally do not hunt. We normally treat it as sanctuary unitl the last week of the season when we are on doe patrol. I had the first doe come by and pause at 17 yards. I drew back my 57# bow, anchored and released a MFX 500 classic with a 145 grain Wensel Woodsman. It disappeared into the hair I was focusing on. I mean dead on it! She ran about 50 yards and tipped over. 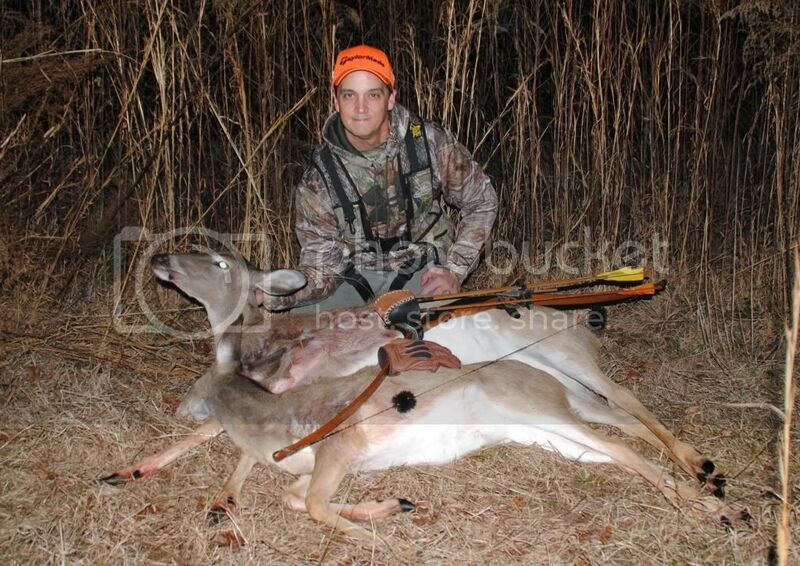 A short while later, 5 more came walking down the trail and I got another doe broadside at 15 yards. I drew, anchored and watched that fletching hit the exact same hair I was aiming at. She ran about 40 yards. Today, I felt like I was an accomplished archer. I hit exactly where I was aiming 2 times in a row. There is something about this Trad Archery that really digs at my existence. It is hard to describe, but it is very much a part of who I am as a person. It is a surreal feeling that is hard to put into words, but it makes the hair on my neck stand up as I type this. Thanks to all the Trad Gang members that have inspired me to do all sorts of things. Thanks to Huntnmuleys for inspiring me to try it. Thanks to Roy From PA, Pat B, Eric Krewson, Terry Green, Pearl Drums, 4estrekker, John Dill and many others for all the countless tips and suggestions in my bow building blunders. Trad Gang is truly a great family. good job on the does and it's a well told story.. too. Congratulations! That is getting it done. What an accomplishment. Dave Johnson ASL 68" 50#@30"
Congrats on your deer! I have a hard enough time getting one per season. What a great way to end the season! Congratulations X2!